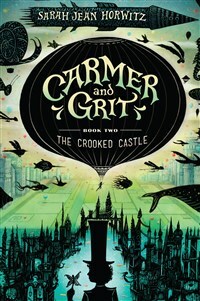 Book 2 of the warmly received Carmer and Grit series features the young magician and one-winged faerie princess as they investigate the dangerous secrets of a magical flying circus. SARAH JEAN HORWITZ was raised in New Jersey, where her love of storytelling grew from listening to her mother’s original “fractured fairy tales.” She lives in Boston. Find her on Twitter, @sunshineJHwitz, or at sarahjeanhorwitz.com.